At Twin Eagles Winter Break Camps, we believe that deep nature connection is critical to whole child development. 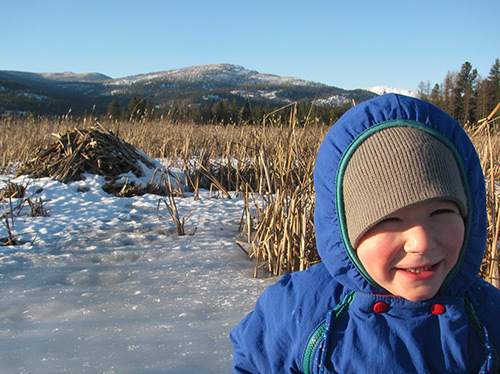 The experiences we offer bring kids back to a simpler, more connected way of life where their senses are honed to once again hear the call of the wild, revel in the feeling of snowflakes falling on their rosy cheeks, delight in the beauty of a snow laden evergreen bough, and feel the deep peace of winter's stillness. 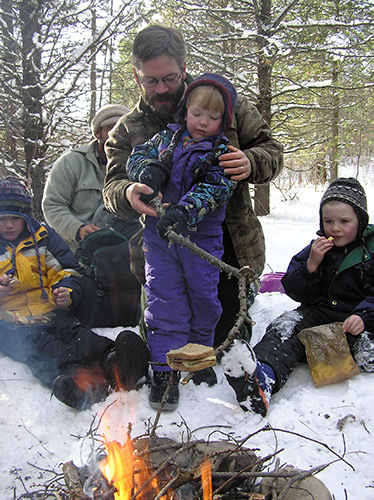 Kids develop authentic resiliency through real world challenges and traditional earth based skills as they experience a deep connection to the natural world. As the deep nature connection journey unfolds, our learning community of kids and instructors become tightly bonded, feeling more like family by the camps end. Natural curiosity is fostered into a heartfelt passion for learning, and a love for the earth rises from deep within. Inspirational and meaningful experiences in nature serve as a doorway to powerful life lessons like authentic gratitude, self-confidence, patience, good communication, awareness, teamwork, problem-solving, and respect for all things all build as kids deepen their connection to nature, community, and self. Kids get to be kids again, roaming wild and free in nature. Real skills, real challenges, real adventures. Learning to make fire by rubbing sticks together, trailing coyotes, carving with knives. Does it get any better? Our highly trained instructors are some of the finest in the field. First Aid/CPR certification, background checks, and a high level of training in both nature based mentoring and traditional earth skills are all requirements. Our staff are adept at really listening to kids, drawing out their passions, and engaging them fully. Our small group sizes (1-5 staff to camper ratio) allow for intimate learning groups to form that feel more like family by camp's end. The deep bonds that form between campers and instructors alike last a lifetime. We have the most fun! Year after year, our campers, instructors and parents consistently report that the Twin Eagles experience is the most fun, engaging, and relevant. The community. Our nature based mentoring approach is rooted in authentic relationship building. Each year the community grows stronger and stronger, and new families often report that they take it in like a breath of fresh air. We're totally unique. You won't find any other camp like us out there. Safety. We take campers physical and emotional safety seriously, and hold every member of camp to a high standard that creates a safe space for powerful experiences to emerge. We focus on the person. Rather than getting lost in the neve rending list of "things to do", we authentically care for the well being and growth of each child. We offer a genuinely holistic experience rooted in hope, connecting with what is truly important in life - nature, community, and self. 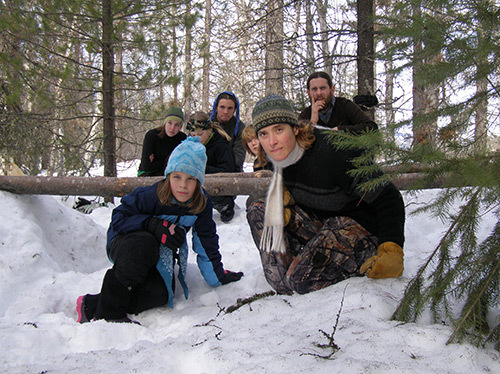 These half week winter break camps are an ideal experience for kids ages 6 to 13 to embark or continue on the deep nature connection journey. Grand adventure, creative expression, huge fun, and unending exploration all join together in these unforgettable experiences that help kids discover comfort and confidence being outdoors and bring their spirits to life. The first word that comes to mind as I write about my son's experience with Twin Eagles is 'Grateful'. I, as his parent, could not be more grateful for the week he spent exploring the wilderness with you. It was such a joy to send him off each morning knowing he sincerely looked forward to the day, and likewise, to pick him in the afternoon and see the smile and look of complete satisfaction on his face. EVERY DAY was like this! You all gave to him knowledge, skills, and spirit that I, as a person, simply could not provide for him. Thank you! Registration is currently open for Twin Eagles Winter Break Camps 2018/2019. Scholarships are available for all youth programs - click here for more information. 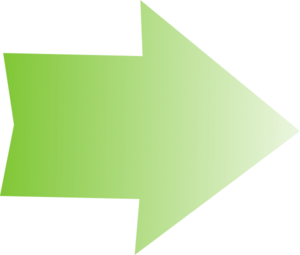 If you prefer to pay by check, click here to download an application packet (pdf) and apply by US Mail. Please Note: Our programs often fill to capacity with waiting lists, sometimes quickly. Your child's space in this program is not reserved until we have received both a completed application and a deposit, and you have heard from us that they have been accepted and registered. Thank you! What is Nature Based Mentoring? 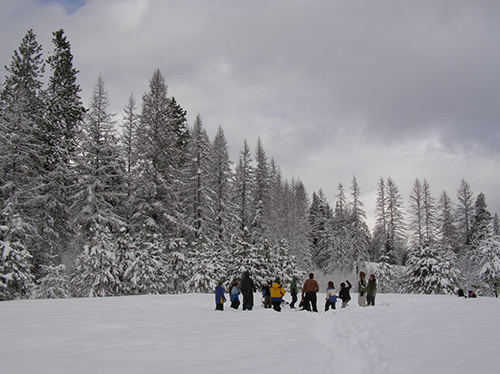 At Twin Eagles Winter Break Camps, Nature Based Mentoring is a system of teaching that blends ancient mentoring techniques from traditional indigenous cultures around the world with tools from modern field ecology and insights from research in brain development, learning theory and experiential education. Learning is facilitated by mentor relationships and by the power of one's direct observation and experience. As well, this process develops one's sense of interconnected identity, increases awareness of natures patterns, rhythms and cycles, teaches many essential life skills and passes knowledge of the earth and traditional human culture from generation to generation. As participants progress through Twin Eagles' programs, they become comfortable and confident outdoors, laying a strong foundation of respect and love for the earth and all of life. Twin Eagles Winter Break Camps honors elements of the traditional mentoring process while also drawing from modern research in the fields of brain development and education - creating a blend of challenges and learning opportunities which address multiple learning styles and foster a child's sensory integration. Teachings of the Earth ~ Developing naturalist skills, using wild edible and medicinal plants, building shelters, fire making, natural rope making, outdoor cooking, native crafts, and more. Teachings of Family and Community ~ Storytelling, music, movement, humor, thankfulness, communication skills, group adventures, respect for all things, and more. Teachings of Awareness ~ Using all five senses, tracking, lost-proofing, self awareness, journaling, native scout skills, bird language, ceremonies, and more. Experience nature's circular time frames, cycles, seasons, rhythms and migrations - providing a contrast to the linear time frame experienced in modern culture and offering a deeper sense of one's place in the natural cycle of life. Increase awareness and outdoor living/survival skills, which leads to greater confidence outdoors, and a more secure sense of self in the world. Share healthy adventure, challenge and fun within a community of passionate teachers, children and families. Gain a sense of place through direct experience with nature.